So I got back from holiday and had just 2 days to prepare for 14 events over a long weekend. 5 of them were the all vegetarian lunch buffet 3rd year in a row. May sound odd at first but it tastes amazing. 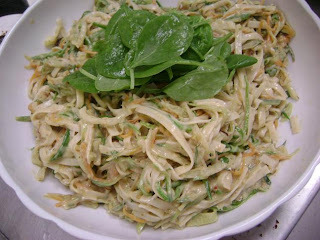 This is a Nigella classic which I found looking for new salads at the start of the barbecue season. Simple ingredients are often the best. Peppers, cucumber, tomato, red onion, feta, olives, mint, plenty of lemon juice and olive oil with baby gem leaves. Shredded vegetables on the madolin sweated. Mixed with thai green curry/ coconut dressing plus the other neccessaries - garlic, chilli, ginger, coriander. As it is a buffet salad it helps if you crunch up the noodles a bit before cooking so you don't end up with huge long strands - easier to eat - go on be kind. Red gem lettuce, black beans (plenty of), red onion, tomato, sweetcorn, mozzarella (becuase I had it - lots of other cheeses you could use), olives, capers, spicy salsa. Idea is you squeeze the lime over before you eat - saves the bowl going soft. Make the bowls like this. I missed photographing the oriental style stir-fry cous cous salad - so much else going on that Sunday morning - a large breakfast delivery and another lunch delivery - and that was only hours after finishing Saturday's events. No point in doing things by half. 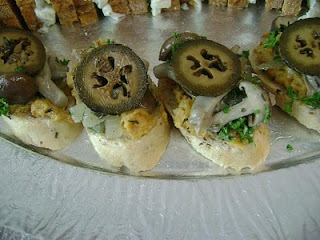 These were in addition to the sandwiches, talking of which, the pickled wild mushroom (and bean puree) open I tried with pickled walnut on top. Another dimension. As I delivered the last one they booked again for next years. So bit of research for some new dishes next year. They all look great, who needs meat! How do you make the fatoush? I'd like to try that. Is it all raw or do you cook any of it first? All raw. Can add garlic & parsley too. Baby plum tomatoes are great in it. Used to make every day in London when the Arabs stayed for the whole of August. Refreshing salad for spicy hot food. I'm planning on trying this soon, I've got a bag of za'atar spice in the kitchen that I think would be brilliant sprinkled over the top. Za'atar spice - yes. Made some za'atar flatbread few weeks ago for moroccan theme meal. Reminds me - some of the fatoush recipes have pitta chopped up in too.